Norwegian mass-murderer Anders Behring Breivik took stimulants before he launched his deadly attacks on 22 June 2011 that left 77 dead. Forensic toxicology professor Joerg Moerland testified on Thursday that Breivik had had taken a "cocktail" of ephedrine, caffeine and aspirin – called ECA. "You can say that he was lightly to moderately drugged," he told the court. Breivik admits to a car-bombing in Oslo that killed 8, and a shooting spree on the island of Utoeya, in which he murdered 77 and wounded 242. The trial is seeking to establish whether the 33-year-old is criminally sane, in which case he will be sent to prison for a term of not greater than 21 years – a duration he has derided as “pathetic.” If not, he will be held indefinitely in a psychiatric institution. 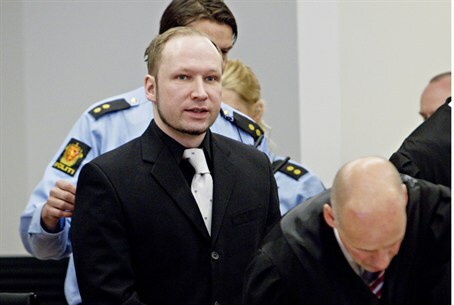 Breivik pleaded not guilty to the charges against him on the grounds that his acts were "cruel, but necessary" to forestall what he describes as a "slow motion Muslim invasion" of his homeland. He has described his victims as "traitors" for having embraced multiculturalism and the liberalization of Norway's immigration law. Moerland, who is employed by the Norwegian Institute of Public Health, said medical records showed that Breivik appeared "lightly drugged" at the time of his arrest, and that "there were traces of ephedrine" in his system. The professor asked Breivik if he had used "an ECA-stack type combination of drugs" on the day of the attacks. Breivik responded, "Yes that's correct. I had made it myself with the help of three ingredients and the dosage was about 50% stronger than commercial products." Moerland then told the court, "You can say that he was lightly to moderately drugged by a centrally stimulating substance – a combination of ephedrine and caffeine." Breivik said he had tried out different doses of anabolic steroids and ECA before the attacks "to make sure my body could handle it". Asked if anabolic steroids, used to build up muscle, could have also been a factor in the attacks, Moerland said: "As I see it, the steroids had no supplementary effect, but I cannot rule out the possibility that this may have contributed to aggressiveness and agitation." Observers note that anyone who drinks coffee or other caffineinated beverages while using many common over-the-counter allergy or cold medications is likely to have some combination of ECA in their bloodstream. Additionally, military research programs around the world have pursued performance enhancing drugs for battlefield soldiers, who must nonetheless remain rational and capable of making snap decisions under pressure. Caffeine, ephedrine, and aspirin – and admixtures thereof – have been at the heart of such research for decades. One leading institution involved in such work is the US Pentagon's research and development arm Darpa, the Defence Advanced Research Projects Agency. "A major effort is needed to measure, classify and understand neural functioning in the battlefield environment," Dr Amy Kruse, a Darpa program manager involved with drug research, noted. The United States Department of Defence press office released in January 2010 that nootropics – or cognitive enhancement drugs – are already used by the US military. They are frequently provided to pilots, for example, particularly those flying extended missions. Moreland's testimony comes on Day 28 of what is expected to be a 10-week trial, after weeks of harrowing evidence from both Breivik and the survivors of his attacks. Earlier this week, prosecutors called on four ‘friends’ of Breivik to introduce salacious testimony about whether or not he is homosexual. Breivik responded "I have not been vain after 2006, and I've never been feminine either," he complained. "The only function that this powder had was as a cover to hide acne."